Cleaning is included in my pricing. I offer discounts for stays over 9 nights in peak winter, and 7 in off peak periods. New master and guest baths just completed. We offer deals for longer stays, and dates that fill-in our calendar. 4-7 occupancy: 4 adults 3 children, or 5 adults 1 child. See bed info we want you to be comfortable! Ka’anapali Royal is located on the 16th fairway of the Kaanapali Golf Course, in the center of the Ka’anapali Resort. The upscale condo complex has low-rise buildings and is very relaxing with lots of open green space and tropical gardens. Our quiet, spacious, top floor unit has an excellent ocean view and overlooks the pool and golf course. Yet only one set of stairs up from the parking lot. Enjoy amazing sunsets while you sip a Mai Tai on our huge lanai. It's a short 5 to 10 minute stroll to Whalers Village and the world famous Kaanapali Beach, consistently voted a world top beach by readers of Conde Nast Traveler Magazine. Whaler’s Village offers a variety of stores and great restaurants. Including Monkeypod Kitchen, Hula Grill, and Leilani's. 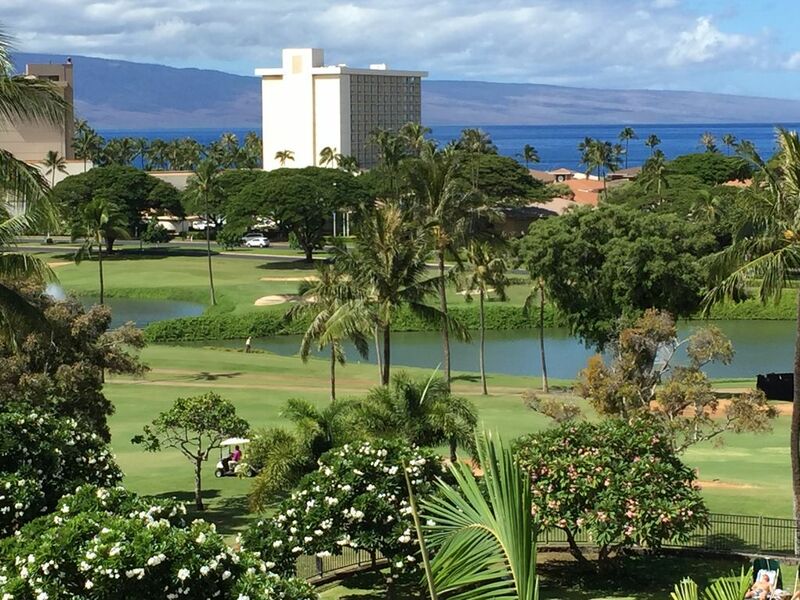 Kaanapali Royal guests enjoy a resort golf discount. 'Black Rock', located on Kaanapali Beach, offers excellent snorkeling. It is only a short drive or free trolley ride to historical downtown Lahaina for excellent dining, art galleries and shopping. Our privately owned condo has over 1600 square feet of living space with air conditioning plus a wonderful huge lanai with BBQ overlooking the pool with a great ocean view. It is centrally located in the complex with close access to the heated pool, spa and tennis courts. Our top floor unit is easily accessible since the parking lot is on the 2nd floor level. We are a short set of steps up one level to great views. The downstairs entrance takes you into the living areas including a large living room, fully equipped kitchen, dining room with seating for 6, and laundry with full size washer/dryer. The living room has a queen sleeper sofa, 55' HDTV, free fastest available internet, DVD, stereo and great views. One bedroom with attached full bathroom, queen bed, ceiling fan, and private lanai is also downstairs. Upstairs we have a very spacious master bedroom and full bathroom with vaulted ceilings & fan, ocean views, king bed, memory foam futon, TV, and DVD/VCR. The gated condo complex has secure parking. There are also two tennis/basketball/picklelball courts, a large pool, 2 gas grills and outdoor dining area, and Jacuzzi. K. Royal is the perfect spot for your vacation in a serene and relaxing atmosphere, it's never crowded. You will always have a lounge chair by the pool! Very close to the beach yet about half the price of oceanfront condos, much quieter and much larger units. * 5 night bookings include linens and cleaning service. * Taxes, daily maid service, $80 parking fee and security deposit additional. * Less than 5 night stays: please call to discuss cleaning fee. * E-mail for rates on extended stays. The most attractive aspect of Ka’anapali Royal is of course the location. We love the ocean views and being so close to the beach without having all the noise and foot traffic. Another deciding factor was the size of the condo being so large at 1,600 interior square feet, plus a huge 350 square foot lanai. We've stayed in many condos throughout the islands and most are small, rectangular, shotgun and feel like an apartment. We love the vaulted ceilings and no noise above us being on the top floor, plus enjoy the nicest views in the complex. The condo below us is rarely used. The complex is friendly, quiet and beautifully maintained. The best thing about our complex is it's never crowded so you can always get a chair by the pool! It's nice to get the resort golf discount at the Ka’anapali courses and be in close walking distance to great restaurants, shops, spas and the beach. We love our morning walks down to Black Rock and along the beach walkway then back up the short hill to home.....a great workout! toilet, shower, Master bath, private - upstairs. toilet, shower, Guest bath attached to guest queen bedroom. Master bath completely renovated in October 2016. Has a walk-in rock floor shower with glass tile accents, granite counter, sink. Guest bath renovated October 2017. Lahaina is just 2 miles south. Front street has many shops and restaurants, including the famous Fleetwood's (Nick Fleetwood of Fleetwood Mac) Kimo's, Ruth's Chris, Cheesburger in Paradise, more! We are located in the main part of the Ka'anapali Resort, not up the street like Westin Villas or many other condos. We have beautiful views from the living room, kitchen, large lanai, and master bedroom. The view looks over the pool, 16th fairway of the golf course, past the hotels and Whaler's Village accross the ocean to the isle of Lanai. Sunsets are spectacular! Ka'anapali Royal is on the 16th fairway of the Royal Ka'anapali championship golf course. Fairway is between us and Whaler's Village and the oceanfront. Watch golfers from the lanai and pool deck! The parking lot side of the building faces the mountains. Includes the guest bedroom and it's small lanai. Fantastic ocean/golf/pool views from lanai, living room, kitchen, and master bedroom. Unforgettable sunsets! Our unit is 100% air conditioned. All linens are provided, including extra towels and beach towels. TP, soaps, starter dish-washing soaps, etc. Full size. Not a stack, just like home! Secure (gated) on site parking is $80 per stay, no matter the length. Almost all year it's also possible to register two cars. Fastest cable wireless "turbo" internet available. Free WiFi is inside the condo and by the pool. 55' TV, stereo, sleeper sofa, two easy chairs. Spacious! Ocean and golf views. Coffee grinder and espresso machine, Keurig too! Misc extra cooking stuff, and usually spices. All appliances 2 sets of dishes, lots of cookware. You can prepare just about any meal, very well stocked! Table seats 6 with extra leaf. There's also a 4 chair table for dining on the lanai, and a 2 chair cocktail table. 200+ channel most are HD. Free Broadband internet access too! One in the living area, and one in the master, each with DVD. Has a dock for newer iPhones. Ka'anapali Royal has a library by the pool. Take one, leave one! We have a few young children's toys. Sand pails etc for the beach, air matts, float tubes, boogie boards, beach chairs and misc. snorkel equipment. I cannot guarantee what is there, however. Lots of Disney movies for the kids! Royal has several acres of lush tropical grounds and a grassy area inside the pool and outside the pool area. We have misc. snorkeling equip, but not guaranteed as folks lose stuff! Also boogie boards and misc. toys and floats. Overlooks 16th fairway of the Kai Ka'anapali course. Ka'anapali has two - 18 hole courses, and a driving range. Clubhouse/pro shop and Roy's restaurant. Ask for the resort discount. Large fully tiled solar heated pool with lots of lounge chairs with shades, palapas with chairs & tables, BBQ dining area. Restrooms and borrow a book library. Huge pool for size of complex. Shared large jacuzzi/spa by the pool. Central Air Conditioning, DVD, Stereo/CD Player, Cooking Utensils & Linens provided, Full-size Washer & Dryer,Free Broadband Internet jacuzzi (shared), A short walk to the Beach & across from Whalers Village! This apartment hit all our requirements - it was clean and comfortable (the bathrooms are especially nice), extra sheets and towels, etc. The location was also perfect for us - it’s located on a golf resort but is only a brief drive to Kaanapali beach and Whaler’s Village, and a short drive to Lahaina town. The owner was quick to respond to questions and requests. We hope to stay here again! Our party of 5 stayed for a week at J301. It’s in a great location near the gorgeous Ka’anapali Beach. The unit is spacious and part of the reason we picked it over other units is for the futon in the master which fit our 2 kids comfortably and for the ocean view which we enjoyed over dinner several nights. The kitchen is a bit dated but well stocked. The bathrooms are nice and updated. There are multiple beach chairs, umbrellas, boogie boards, sand toys and inflatables to use which really made our time at the beach and pool more enjoyable. We were notified ahead of time that the A/C for the complex would be undergoing maintenance for a few days of stay. Unfortunately on the second morning of our stay the unit A/C sprung an unrelated leak which started dumping water into the lower bedroom and the entryway. Rick was extremely responsive and had someone from maintenance come out right away to stop the leak. He also had extra towels delivered because we had to use some to soak up the water, as well as someone to come clean and dry the carpet in the bedroom. Two days later he had 2 portable A/C units installed. The unit has several fans so it really wasn’t needed during our stay (highs of 80ish) but the accommodation was appreciated. We thoroughly enjoyed our stay at Kaanapali Royal J301. The condo was close to everything: beaches, restaurants, downtown Lahaina. The condo was clean and had every amenity we could ask for. We would definitely stay there again! We thoroughly enjoyed our stay in Kaanapali Royal J301. The condo was conveniently located to everything: beaches, restaurants, downtown Lahaina. The condo was clean and had every amenity we could ask for. It was a great value for the price and we would definitely stay there again. The property and the location were great, but our unit had numerous age related issues. The kitchen was the worst: outdated decor, dirty walls, old appliances. The cupboard under the kitchen sink was completely rotten, and the master bathroom shower drain was plugged. We weren't allowed to adjust the A/C, which made for some sweaty nights. None of these are dealbreakers, but made for a less than ideal stay. On the upside, the owner was pleasant and easy to reach. Also, boogey boards and beach chairs were graciously provided for our use. We're sorry you were not totally happy with our condo. Not sure what the AC/temperature problem was...the thermostat goes as low as 66 degrees and the weather in February was on the cool side. I wish you would have called me about it! Perhaps under the kitchen sink was dirty from a prior guest and likely needs new liner paper. Our kitchen appliances were all purchased within the last 7 years. As far as the master drain, hair builds up and has to be cleaned out...I had a plumber there the same day you brought that to my attention. Guests do need to understand that these types of rentals are not going to include the same amenities as hotels. The price should be a clue. The same amount of space, 2 bedrooms and 2 bathrooms, 1667 square feet will cost well over $800/night most properties on Maui. We try to keep our rates within the $300 range as a great value. This was an amazing place to stay. It has everything you need and more. We loved the location. The view was spectacular. It was very spacious and clean. Rick was super easy to work with. I would definitely rent this again. My only complaint was that I didn't stay there longer!! One of America's top beaches, whale watching, night club, sunset dinner Cruise, snorkeling trips, bike down the crater, Zip lines, Art Galleries, casual and fine dining, luaus, shopping, world class hotels and spas. Maui has been named the number one island destination by Conde Nast readers for over 15 years. Ka'anapali is the original master planned resort in Hawaii with family focus. No added cleaning fees. Ask for quote, I sometimes offer deals in lower demand months, and if you are flexible on check-in dates, so that we have no open dates on our calendar. Refund Policy: 1 night if cancelled over 60 days prior to arrival, no refunds 60 days or less prior to check in. Parking fee increase to $80 4-1-17.